I came across the thought-provoking work of Julie Dodd recently via Twitter. She's an installation artist in England who uses discarded paper as her material of choice to focus on environmental issues. Julie's concern about the decreasing number of migrating bird species due to loss of habitat (trees) and climate change in the UK, is what prompted her Paper Eggs project. She worked with magazines because of their fleeting nature, translating them into objects that possess a sense of permanence. Julie says she often feels compelled to work in multiples. Her creations mimic life, growth and regeneration, thus this stunningly beautiful collection of eggs. Julie stacked and glued layers and layers of magazine pages, returning the paper to a wood-like substance which she then sculpted. On a related note, she recently spent a year on a fellowship project at Wirral Metropolitan College in England where her body of work was similarly based on the declining number of trees and its impact on the planet. Julie created a miniature paper forest canopy to emphasize that carbon dioxide absorbing trees are the lungs of the world. A Year of Trees is well worth a look. Can't find words to describe the beauty of all of julie's work. The eggs have such a smooth finish ,must have been such a lot of work gluing all the paper together. A year of trees by her is so inspiring. I recently have been looking at Dodd's work, too. I think it's wonderful. these are so beautiful. Incredible Julie; love them! Wonderful use of recycled magazines and creating such wonderful mimics of nature's bounty like you do. Oh my gosh, those eggs are simply gorgeous! Ann, thanks for showcasing Julie's artwork. I adore her cell books, textiles pieces and the Human Nature 3d piece. 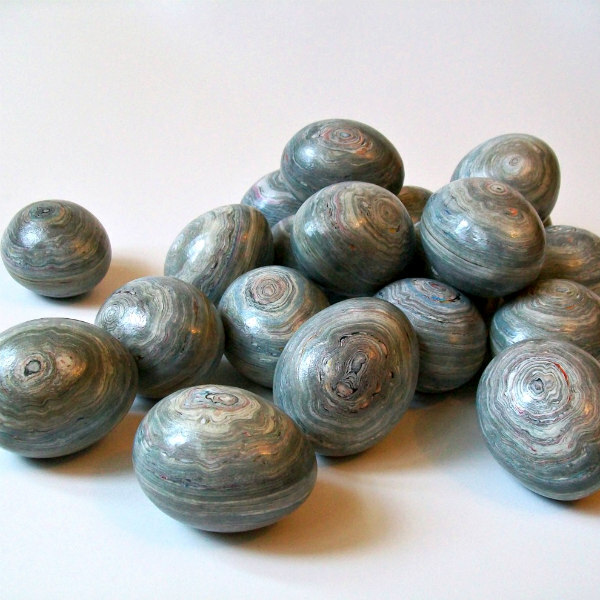 I would love to be able to hold one of Julie's sculptured paper eggs. Wow, those eggs are stunning, what a wonderful project she is doing!